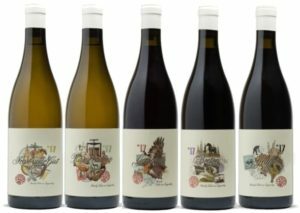 One can’t have too much of a good thing, they say – so here’s a little more about Lukas van Loggerenberg’s latest wines, to add to Christian’s impressions (see here). 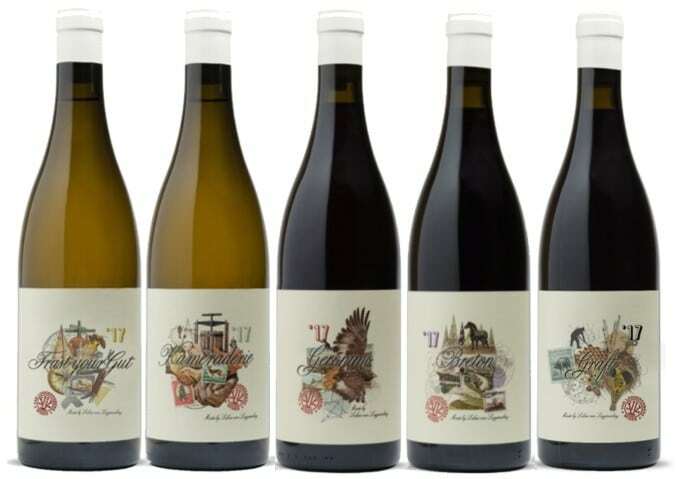 The 2017 vintage adds two new wines to the 2016 list of three, and once more we can invoke the idea of the more the better, so long as they elaborate the fine tradition inaugurated by the maiden releases. The wines are all made in what I’m sure Lukas would agree are pretty primitive conditions in a large old shed on top of a Devon Valley hill, on a farm rather pleasingly called Fransmanskraal. The shed and farm are owned by the family of Danie Carinus, and instead of rent Lukas makes the excellent (and also burgeoning) range of Carinus Family Wines for Danie and his (very distant) relation Hugo. Amazing the sophisticated stuff that can emerge from such simplicity. And the winemaking is all simplicity too, as hands-off as you might want, but not insisting on the wines’ connections to that amorphous and rather self-conscious, often recipe-driven family of “natural wines”. For example, the only one of them that is closer to 12% than 13% alcohol is the marvellous light and elegant Break a Leg Blanc de Noir – together with the L’Ormarins Jean Roi far ahead of most Cape rosé (the 2017 already sold out, unfortunately). So, although lightness and freshness are de rigeur, compared to some of the more aggressive avant garde wines, Lukas’s tend to the ripely balanced: more Sadie than Testalonga, perhaps. Last week, at Lukas’s Ex Animo joint tasting with the wines of Jeanine and Mick Craven, I was particularly pleased to taste the new Van Loggerenberg Graft, a blend of cinsaut (55%) and syrah off granitic soils on Stellenbosch’s Polkadraai Hills. (Particularly pleased, that is, as I’d already bought some in advance!) This area is also the origin of one of the greatest Cape syrahs, Reyneke Red Reserve, and Graft undoubtedly shares some presumably terroir-derived characteristics with that wine, from the drily spicy, almost cinnamon notes on aroma and flavour, to the excellent balance with a firm but understated tannic structure (not the effortlessly suave tannins of Swartland granite, but fine and subtly informing). Whole-bunch fermentation seems to work perfectly for this wine; it’s ripe at 13.5%, but again that seems just right. The cinsaut is in great harmony, adding some lighter, perfumed charm and freshness but not a shred of vulgarity – although the cinsaut is just in the majority, I feel that the syrah is, very properly, in command here. It’s still shyly subtle, but very complete wine, with surely a long and noble future. The darkly bright Breton Cabernet Franc 2017 is a fine follow-up to the maiden vintage, which is probably enough to say to anyone who tasted that splendid earlier wine, made, uniquely in the Cape, according to the inspiration of classic Loire rather than Bordeaux cab franc (though I suspect that some of the other makers of this grape here are already showing some liberation from great ripeness and oak influence, thanks to Lukas’s example). I wonder if this one isn’t perhaps a touch more concentrated and youthfully stern than 2016. Certainly my bottles will rest unmolested for many years. Geronimo Cinsaut, blending Stellenbosch and Paarl Fruit, is (like the Craven version which was also tasted at this event) at the more serious, less overtly tutti-frutti end of cinsaut winemaking. Plenty of perfume and flavour, but refined and restrained, with a good acidity and a nice tannic bite. There’s a new Van Loggerenberg chenin, not very elegantly called Trust your Gut, from a mix of Swartland, Stellenbosch and Paarl fruit. Fine, weightless, with a lovely soft texture and a good, quietly penetrating acidity; readier to drink than the Kamaraderie. A real touch of the Loire here, I thought, with the notes of hay and honey reminding me of a dry Vouvray. Kamaraderie is the more serious of the chenin pair, less immediately charming now, but with greater intensity of flavour and greater firmness of structure. Finer than the maiden vintage, I’d venture. Pricing is an issue. The Van Loggerenberg wines are quite expensive by local standards, but differentially so. If you’re looking for better bargains, you could certainly find them in the rather crowded chenin market and also cinsaut (Kameraderie is about R400, Trust your Gut a bit less; Geronimo R260), but I reckon these are worth their price. The Breton and Graft, about R370 each, are more notably incomparable, as well as excellent in themselves, which makes the question of value rather different. I’ve bought three of each of them myself, which can stand for my opinion. Great review of even better wines! I’m one of the privileged few who can taste them from grape to glass and they always just seem to keep their integrity and personality. Not unlike Lukas. Just to clarify, Fransmanskraal is owned by Hugo’s family. Our farm is in the Polkadraai.